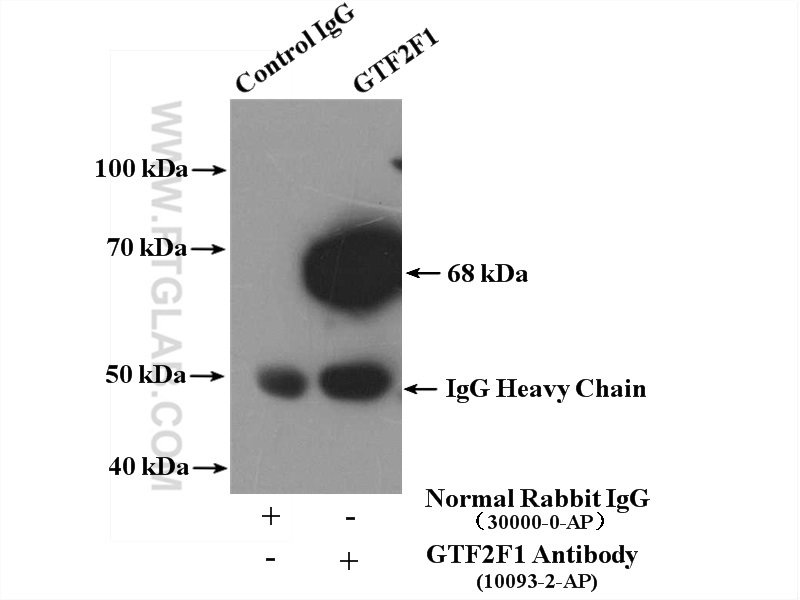 IP Result of anti-GTF2F1 (IP:10093-2-AP, 4ug; Detection:10093-2-AP 1:300) with K-562 cells lysate 4000ug. In eukaryotic systems, the initiation of gene transcription involves the ordered assembly of a multiprotein complex on proximal promoter elements, consisting of RNA polymerase II and broad families of auxiliary transcription factors. Such factors can be divided into two major functional classes: the basal factors that are required for transcription of all Pol II genes, including TFIIA, B, D, E, F and H; and sequence specific factors that regulate gene expression. The basal transcription factors and Pol II form a specific multiprotein complex near the transcription start site by interacting with core promotor elements such as the TATA box generally located 25-30 base pairs upstream of the transcription start site. TFIIF, a heteromer composed of a small (RAP 30) and a large (RAP 74) subunit, acting at an intermediate stage in initiation complex formation, binds directly to RNA polymerase II in solution and decrease the affinity of RNA polymerase II for nonspecific DNA. In addition, TFIIF stimulates transcription elongation by RNA polymerase II.